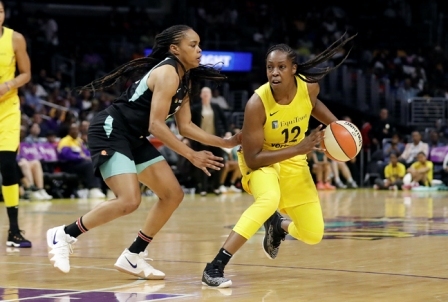 The Los Angeles Sparks defeated coastal opponent, the New York Liberty, 74-66 in a back and forth battle led by a career-high performance for Sparks’ guard Chelsea Gray at Staples Center on Tuesday evening, August 14. The Liberty would lead by as much as nine points in the game. Though statistically in nearly every category the Sparks are far better than the Liberty, who currently have the second worst record in the league, the Liberty competed at a high level for three quarters. “That’s like a playoff game where you just have to grind out every single possession,” Agler described. With a minute left, Gray stepped back and nailed a three-pointer followed by drawing contact on the next possession and sinking a pair of free throws to put the game on ice. She led the Sparks with 26 points and 5 assists. With three years of experience with the Sparks, Gray has blossomed into the player that Agler trusts with the ball in her hands. On fan appreciation night, the Sparks gave Los Angeles fans something to cheer for with a win after suffering back-to-back losses. Boxing champion Floyd Mayweather sat courtside to take in the WNBA action. Gray was shaken up on a play where she collided with a Liberty defender in the paint in an attempt to slide over and take a charge. She was down on the court for quite some time before being escorted to the locker room with the training staff just before half-time. She would emerge and finish out strong out of the half. Agler elected to start Riquana Williams at the guard position over Odyssey Sims. Williams struggled offensively shooting 1-for-7 from the field for just three points. She still managed to make key contributions on defense including two steals. At the half, the Sparks trailed 44-38 as the Liberty’s center Tina Charles scored 16 first half points. The rest of the way, Charles scored just five points in the second half for a total of 21 points on the night. The Liberty have a 7-23 record and entered the game having lost nine consecutive matchups. Los Angeles are better both offensively, scoring 79.2 ppg to New York’s second-worse of 78 and they also have the second-best defense in the league, allowing 77.2 ppg to New York’s 84.8. Los Angeles won both of the previous meetings against New York so far this season (at home by 36 points and on the road by one). The Sparks forced 18 turnovers for 24 points. Sparks’ forward Nneka Ogwumike contributed 20 points and eight rebounds to the Sparks victory. With just two regular season games left before playoffs, the Sparks know every game is in preparation for the playoffs.